CHAVINGTON STREET MARKETS, Povscum, Tuesday (NNN) — The Home Office’s “Stain Of Moral Inadequacy, Social Approbation And Endeavouring To In Some Small Way Redeem One’s Lowly And Unworthy Self In The Eyes Of The Community” scheme vests were officially launched yesterday in Slough. 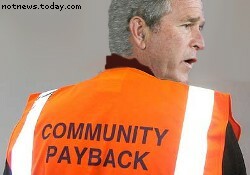 The words emblazoned on the vests — shortened to “Community Payback” in practice, as the full phrase was too long to fit on vests smaller than XXXL — are now mandated for convicted criminals on community service orders, to alert morally-upstanding citizenry that offenders cleaning graffiti or laying pavements are being punished rather than paid and that they are in a Sanctioned Tutting Zone. The vests are achieving great popularity and underclass social cachet, with unofficial knockoffs proving vastly popular in street markets in more value-conscious districts. They join such fashionable items as reproduction electronic leg tags and ASBO certificates, many carrying such famous names as Goochi, Louie Vitton and Dolchi ett Gabbarner — all completely genuine, my very dear friend, I absolutely would not lie to you under any circumstances. The Beardie Bleeding Hearts’ Union pointed out that the vests had already led to several gangland shootings, but the press waved this away as providing them with more journalistic titillation for their suburban readers to be appalled at the behaviour of those nasty common poor persons handily killing each other off. Home Secretary Jacqui Smith said the scheme was already a success, as measured by the many column inches in the press today. “The important thing is to be seen to be doing something.” Next month’s initiative will involve floating neon signs attached to balloons with arrows pointing down at the offender, and the following month’s will introduce vests for opposition MPs arrested under the Official Secrets Act. The Home Office is also looking into licensing rotten tomato and cabbage stalls in tutting zones.